Today was Daniel's first day back at school, so for fun we made cake when he got home. 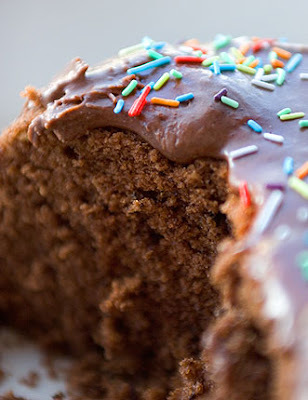 This cake is great to make with kids because it cooks in the microwave in 9 minutes! Or, you know, when there's no chocolate in the house and you're PMSing and you have a need for something that crucially combines chocolate and carbohydrates. Or so I've heard. That's never happened to me. Ahem. Mix everything together while the milk is heating. Pour in the hot milk and beat quickly. Pour into a microwave safe dish (it needs to be about cake pan size or bigger) and microwave on high for 9 minutes. Leave to stand for 5 minutes. Let it cool before frosting (if you can bear to wait).